PayPal demonstrated today, for the first time, how it intends to provide payments to physical retailers as the race heats up to make wallets and clunky metal registers obsolete. A sneak peek was offered to merchants today by the eBay-owned company, at a partner event in Rancho Palos Verdes, Calif., and separately to me in one-on-one briefings by executives. PayPal had said it was going to launch pilot projects later this year, but this is the first time it is discussing how it will approach the digital market and how it will defend itself against incumbent payment providers like Visa, MasterCard and American Express, and new entrants like Google and San Francisco-based Square. There were roughly 150 merchants present at the event, including Home Depot and Sports Authority. 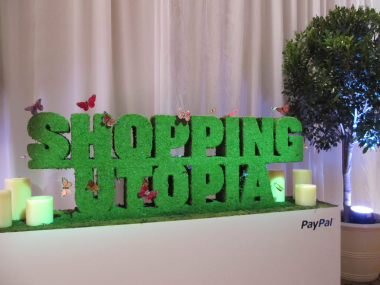 In the resort’s ballroom overlooking the Pacific Ocean, PayPal set up several user scenarios that are intended to disrupt the way we pay for things online and in stores today, using a variety of technologies. What stood out was that none of the scenarios required merchants to adopt new infrastructure or buy new terminals. Likewise, customers won’t be required to upgrade their phones or have certain types of bank accounts. 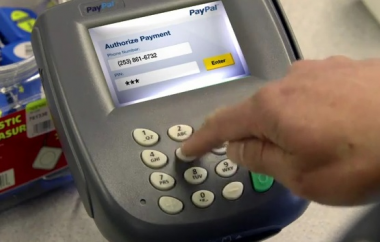 Instead, PayPal users (of which there are 100 million worldwide) will be able to pay by entering a phone number and a PIN code at the existing payment terminals, or by swiping a PayPal-issued card that’s not associated with a bank and does not have an account number printed on the front. A lot of criticism has surfaced recently that new mobile payment solutions relying on near-field communication will take three-plus years to adopt, because of the infrastructure required by merchants and consumers. Others have pointed out that near field doesn’t exactly solve a problem for consumers, since swiping cards at retail is easy enough. “No one is solving the friction in the entire payments process. We are not going to change consumer behavior,” admits Sam Shrauger, PayPal’s VP of global product and experience. Grocery store: In this senario, PayPal demonstrated how someone could use their phone number to pay. At the payment terminal, a user will be able to enter their phone number and a PIN code. The purchase will then be applied to the bank account or credit card associated with their PayPal account. Coffee shop: In this scenario, PayPal demonstrated how it will allow users to continue using plastic cards if they wish. The card will be issued from PayPal and will not have a Visa or MasterCard logo on the front, and will contain no visible account information. As usual, the card will be swiped at the terminal and have an associated PIN. Hardware store: In this scenario, a customer in a store sees a barbecue set that they’d like to buy. Using the phone, they scan the item’s barcode. PayPal would find that exact product that is in stock at that retailer, and the user would be able to check out in the store aisle and have the item shipped to his or her address, without ever going to the register. All of PayPal’s scenarios had a few things in common. For example, users would be able to check in to a retailer’s location from the phone, like on Foursquare. That would enable a merchant to know that they are there, so they can interactively offer you coupons, or so you can place an order. PayPal will also let users immediately apply for credit, so they can buy a new TV and pay in six easy installments! The mobile application is also front and center in all of these use cases. Users will be able to find nearby retail locations and check in using a mobile application. PayPal has stitched all of these technologies over the past year from several million-dollar acquisitions, including the acquisitions of BillMeLater, Milo, Where and Zong. BillMeLater enables PayPal to extend users credit on the fly; Milo allows PayPal to look up the inventory within major stores; Where provides location-based offers; and Zong provides mobile payments using your phone number.